The coming months are exciting ones for the Conference and Events Venue, as they have 82 events confirmed until the end of the year! 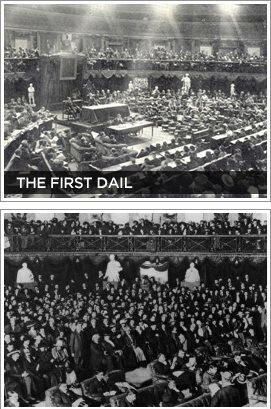 The time to book your 2019 event in the Round Room is now, as 2019 marks the 100 year anniversary since the first Dáil Éireann was held in the Round Room on January 1919. The ‘First Dáil’ of 1919. This Dáil was an assembly established by Sinn Féin MPs elected to the House of Commons of the United Kingdom in the 1918 United Kingdom general election. Upon winning a majority of Irish seats in the election (many uncontested), Sinn Féin MPs refused to recognise the United Kingdom parliament and instead convened as the First Dáil Éireann (translated as “Assembly of Ireland”): the unicameral legislature of a new notional Irish Republic, and the first Irish parliament to exist since 1801. The first meeting of Dáil Éireann occurred on 21 January 1919 in the Round Room of the Mansion House: the residence of the Lord Mayor of Dublin. Being the first and highly symbolic meeting, the proceedings of the Dáil were conducted for the only time entirely in the Irish language. The Dáil elected Cathal Brugha as its Ceann Comhairle (chairman). A number of short documents were then adopted, this included the Declaration of Independence, that asserted that the Dáil was the parliament of a sovereign state called the “Irish Republic”; the Dáil established a cabinet called the Ministry or “Aireacht”, and an elected prime minister known both as the “Príomh Aire” and the “President of Dáil Éireann”. Book now your 2019 event in the Round Room, one of the most historic and important venues in Dublin city centre.